3.5mm stereo audio cables from Cables To Go are specifically designed for quality computer audio applications. 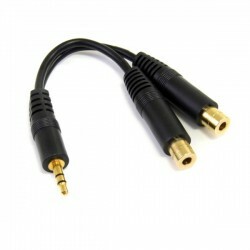 The 3.5mm cable connects the PC sound card, portable CD player or any mini-stereo audio device with 3.5mm jacks to multimedia speakers. The cable features two 29-gauge stranded conductors and a drain wire, which are tinned to resist oxidation.